Good evening! I had a few minutes this evening to sit down and make a card. I've had a baby card stuck in my head for the last few days. My cousin Timmy called the other day to announce that he and his wife are expecting their first kiddo! WOW! Timmy is my age and we literally grew up more as brother and sister than cousins, so this feels so extremely special. Plus, I absolutely love Erin, his wife. They're due in October, so we've got a little wait... And this most definitely needed to be a gender neutral card. :) This card's going out in the mail tomorrow. 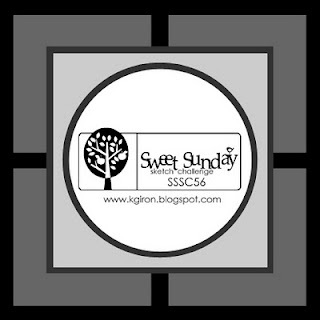 I used Karen's Sweet Sunday sketch for my layout. I love the square background panels. I fiddled a bit with making them two different colors, but settled with just the one to keep things a bit more simple. I paper pieced the baby carriage from the same Pretty Pastels dp. Some tiny dollops of stardust stickles to the polka dots and heart added just a little bit of sparkle. Can I just say I am soooo glad it will be Friday tomorrow? Weeks back at work after a vacation always are tiring. Those four days off were wonderful, but they sure throw my everyday routine out of whack. Especially my sleep schedule. And having the Olympics to watch each night really isn't helping in that department.... But I can't miss the Olympics! I usually give in around 10:15 and push record. The tricky part is finding time the next day to watch the tape before the new coverage comes on for the night, lol. On top of all of that, we had two late nights at work- Science Fair and Talent Show. It's so fun to be there and witness my kids' creativity, but it sure makes for looooong work days! I'm off to Disneyland again this Saturday to hear my roomie play. One of her chamber groups will be playing in Carnation Plaza late morning. Fun! It's supposed to be raining again, so maybe that will keep the crowds down. This is adorable! I love this little baby carriage and I haven't seen it in such a long time! Very sweet!! Science Fair is next Wednesday and thankfully my son did his in class presentation today and my daughter will do so on Monday so we are basically D-O-N-E done for another year. Always fun to see what everyone has done but I hate how much of it is a parent versus parent display....oh well. love this colour combo and that stroller is too adorable!! Your bow and button are PERFECT!! Wow!! Have a great weekend...we have a Professional Day tomorrow so no kids and a chance to catch up with my teacher friends :) The Olympics have been so exciting!! Just watched our curling teams win their games today (well, saw the one tonight and read about the others during the day). I'm a big curling fan...but as Marisa said, I love your snowboarder, Shaun White...he was more than amazing!!! Wow!!! It looked like it was special effects or CGI with him flying through the air...incredible!! You whipped this beauty up in a couple of minutes??? There's a word for ladies like you... talented! I just love its simplicity, but your perfect buttony bow is well, perfect! This is such a great card! I really like following your blog. You have a lovely design and color combination sense. Thanks for sharing. I love the card :) So cute! Your cousin will love it! The Olympics are interfering with my life too--LOL! I didn't get in bed until almost midnight last night. I told my 1st graders today that we were going to take a nap. They liked the idea until I told them to put their heads down :) If only we could take a nap at school! Your card is beautiful! I love the colors, the layout and everything about it. True inspiration. Hope you get back to your old schedule soon. 4 days off would be nice but we always pay the price.